ROME - A series of meetings will take place over the next four days between Vice-President of the International Fund for Agricultural Development (IFAD), Cornelia Richter, and Bolivian government officials and development partners. Together, they will discuss how to strengthen alliances and improve the lives of rural poor people in Bolivia. 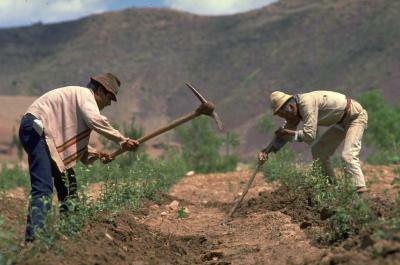 Recent National Statistics data has shown that poverty decreased by 21 points in Bolivia between 2005 and 2015 (from 59.6 percent to 38.6 percent). Yet despite this, a large gap in living conditions between urban and rural areas remains. Though only 9.3 percent of the urban population live in extreme poverty, it impacts 33 percent of rural people. IFAD aims to support pro-family-farming policies and programs in Bolivia that ensure national food security and sustainable rural transformation in the context of climate change, which the country has suffered from greatly. Bolivia is one of the world's 10 most affected countries and the negative impact on the economy will reportedly decrease the country’s GDP by an estimated 10 per cent in 2020. IFAD aims to strengthen the capacities of rural organizations, such as cooperatives and producers' associations, and support smallholder farmers who are setting up profitable and sustainable rural businesses. The projects they support pay special attention to the needs of disadvantaged groups such as women, youth and indigenous peoples, and help counter the negative effects of climate change on rural people's livelihoods. Richter will meet with top Bolivian officials, including Diego Pary, Minister of Foreign Relations, Mariana Prado, Minister of Planning, and César Cocarico, Minister of Rural Development and Lands, as well as representatives from other UN agencies, international financial institutions and bilateral overseas development agencies. She will also visit the two ongoing IFAD-supported projects in Bolivia, 'Procamélidos' and 'Accesos'. 'Procamélidos' builds on previous IFAD-funded projects to boost and improve the country’s camelid-related production, and will address challenges such as low productivity, limited availability of feed and water, and low addition of value to raw material. 'Accesos' focuses instead on co-financing the development of self-organized community enterprises, enabling them to connect producers with markets and create economic alternatives in rural areas. This should promote broad-based access to financial services, including savings, credit and insurance.